It’s winter, but that doesn’t mean we put away salads for the season! There are ways to “warm up” your typical thoughts around salads, and still enjoy them raw! Kale is an absolute powerhouse. We all know this, right? It helps our blood and organs detox, brightens our skin, and provides us with otherwise tough to get vitamins like vitamin a, c, e, and k and folate and phosphorous, and more. It’s essential, just like your other dark leafy greens. But for the LONGEST time I didn’t know how to prepare kale so it wasn’t… well… bitter, rough and somewhat disgusting. Now, I enjoy it steamed, in a smoothie finely chopped and mixed into dishes, juiced, and… massaged. This salad below uses this last method to soften the kale and make it easy to chew and enjoy! First, de-vein your kale. You don’t want the woody stem of your kale to be in this salad. And wash. You can wash first, but I often find it’s easier to wash it after it’s chopped up. I chop it finely so it’s easy to eat! **I typically wash my produce in a bowl of cold water with a cup of white vinegar. thoroughly rinse and pat dry. Drizzle a little olive oil, about 2 Tablespoons if you’re using an entire bunch of kale, and in a very large bowl with plenty of room, start working the kale with your hands or - massaging it! Do this for a few minutes. You’ll find the kale will begin to release it’s juices and soften quite a bit! Once you’re happy with the soft texture of the kale, I typically massage it for about 5 minutes, then add the rest of your favorite salad toppings. and something creamy, a healthy fat like fresh, diced or sliced avocado! This doesn’t have to only be a winter salad. Trust me, you can have it any time, but I find it’s an AMAZINGLY complimentary side to just about any warm winter dish I might serve up. It’s also perfect as a stand-alone lunch if you wanted to add a protein on the side! This would be a great side dish to serve up during the holidays or for your Thanksgiving or Christmas dinner! 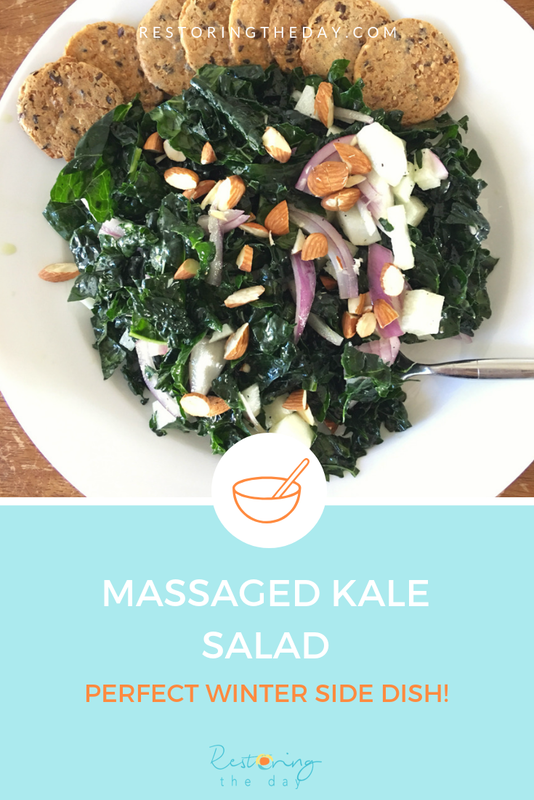 Have you tried massaging kale before? Is this a technique you’ve heard of? I didn’t know about this technique after even YEARS of healthy eating, so don’t worry if you’ve never heard of it, you’re not alone!